The roller LIFO system is intended for the intensive storage of low-turnover goods, loaded on pallets forked-lifted on the short side (800 mm). The roller LIFO system is intended for the intensive storage of low-turnover goods, loaded on pallets forked on the short side (800 mm). The roller LIFO is used to store pallets according to the "Longway" logic, i.e. when the standard pallet shall be forked and stored on the short side and it can slide along the roller tables. The LIFO system has got one single load and pick-up front, which means a further space reduction and optimisation, compared to the traditional warehouse. This clearly shows the advantages of MDR warehouses: space optimisation, reduction of trolleys in use, personnel reduction, more safety, greater user-friendliness. 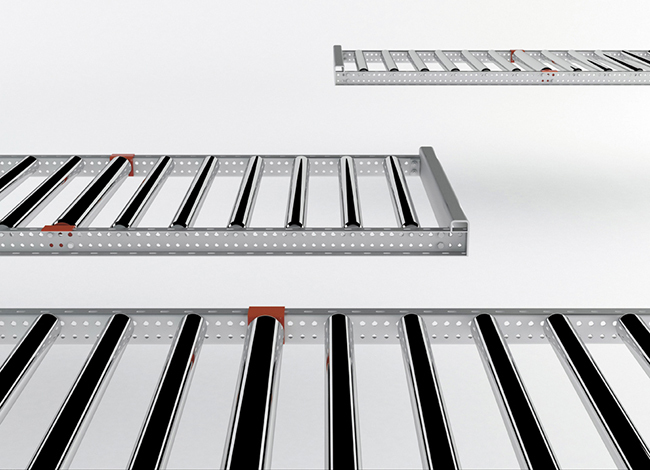 The LIFO warehouse consists of countersloping ways, made up of several modules, inclined by 4%. This ensures that goods are constantly made available on the load/unload front and it can provide for an easy management of stocks. Every single module consists of bearing idle rollers, the pitch of which is suitable for their own load units. The load system of goods is of a push-back type: the pallet to be stored pushes the units already arranged on the way to the bottom. At the time of unloading, the pick-up of a pallet enables the subsequent ones to move down to the unload front. A solid protection side preventing the pallet from knocking against the warehouse wall is arranged at the end of the travel.